Onset, a world leader in data loggers and weather stations, today announced a range of solutions that enhance the ease, flexibility, and reliability of monitoring microclimates, from indoor greenhouses to the harshest outdoor field environments. The HOBO MX2300 Series temperature and relative humidity (RH) data loggers use Bluetooth Low Energy (BLE) that enables users to easily offload data to their mobile devices. The HOBO USB Micro Station data logger features five inputs that accept a wide range of Onset’s plug-and-play Smart Sensors for environmental monitoring, plus a USB port for fast data readout. Both the HOBO MX2300 Series and HOBO USB Micro Station combine research-grade performance with compact, weatherproof enclosures. Together, they provide users with a range of choices for microclimate monitoring in a variety of applications—from research in agriculture, forestry, and ecology, to viticulture and greenhouse cultivation. HOBO MX2300 Series loggers dramatically cut the time and effort needed to collect field data. Incorporating Bluetooth (BLE) technology, they allow researchers, growers, and others to wirelessly access high-accuracy temperature and humidity readings right from their mobile phones or tablets—eliminating the need to take a laptop or data shuttle into the field to retrieve data. A 100-foot wireless range makes it easy to offload data in hard-to-reach locations, such as tree canopies, nests, and green roofs. The loggers work with Onset’s free HOBOmobile app for easy logger setup and configuration and effective data management while in the field. From their mobile phones or tablets, users can view data in graphs, check the operational status of loggers, share data files or graph images, and store data in the cloud. There are no cables to deal with, and no devices to pair. 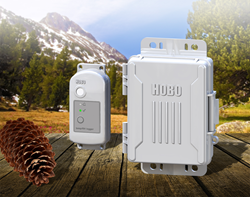 HOBO MX2300 Series loggers are available in five models spanning a range of outdoor temperature and RH monitoring applications. The series includes internal sensor models that are highly durable and easy to deploy, and external probe models for faster response times and that are well-suited for monitoring conditions in soils, water, and more. All of the loggers feature a compact, rugged weatherproof housing designed for long-term studies, and they provide 0.2C accuracy, ensuring that users get reliable measurements. Wireless communication means the loggers can be deployed entirely inside a solar radiation shield for high reliability, while still enabling users to offload data using their mobile devices. The HOBO USB Micro Station is a research-grade, multi-channel data logging weather station that comes in a compact size for simple deployment. The logger’s hinged door makes it easy to plug in sensors, and mounting tabs make it easy to mount the logger using zip ties, screws, or U-bolts. With the USB Micro Station, researchers can easily monitor a range of environmental conditions at an affordable price. The weatherproof battery-powered station combines the flexibility and sensor quality of more expensive systems with the convenience of plug-and-play operation. It features five inputs that accept Onset’s full range of plug-and-play Smart Sensors for environmental monitoring, such as temperature, soil moisture, rainfall, and wind. Users can simply plug in any of the Smart Sensors and begin monitoring weather parameters, without having to spend time on complicated wiring or programming. The HOBO USB Micro Station is equipped with a built-in USB port to enable fast, efficient readout of data to a computer. To configure the Micro Station or offload data, researchers can use Onset’s HOBOware software, which also allows users to view, graph, and analyze data with point-and-click simplicity. Both the HOBO MX2300 Series and the HOBO USB Micro Station Data Logger are available today. The HOBO MX2300 Series offers five models with prices ranging from $110 to $199. The HOBOmobile app for the loggers is available as a free download for Apple iOS at the Apple iTunes store. The HOBO USB Micro Station is priced at $220. The accompanying HOBOware software is available for computers running either Microsoft Windows and Apple OS, and it can be downloaded for free at http://www.onsetcomp.com/hoboware-free-download. More information on sensors that work with the Micro Station can be found at: http://www.onsetcomp.com/products/data-loggers/h21-usb. Additional pricing details and technical specifications for both the HOBO MX2300 Series and HOBO USB Micro Station Data Logger are available at http://www.onsetcomp.com.